Make outdoor dining a comfortable and stylish experience with the Corfu Outdoor Dining Chair. With a cushioned seat and refined design, it’s a dinner party dream. Style the piece with the rest of the Corfu Collection. We’ve used the finest weatherproof materials, so the Corfu stays looking great in rain or shine. Quick dry foam mesh. Naturally weather resistant, sustainable teak. And mesh that allows water to drain easily and efficiently. Nanotex fabric uses nanotechnology to increase its resistance to spills and stains. And is just as soft as a traditional fabric. The Corfu comes upholstered in this, in an elegant Ash Grey hue. Host elegant garden parties with friends and family. The Corfu brings the style factor. 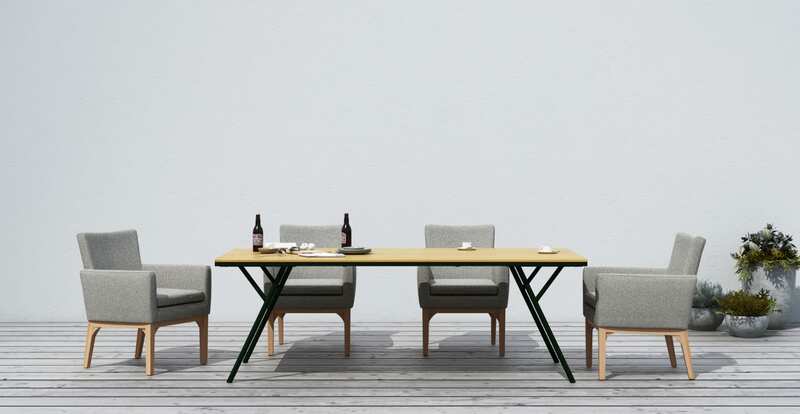 With its cosy embrace and level armrests, it’s perfect for long meals and chats. See more outdoor furniture from our range. What are the benefits of Nanotex fabric? Nanotex fabric has been enhanced using nanotechnology, to increase its resistance to spills and stains. It is breathable, wrinkle free, and as soft as a traditional fabric. FSC stands for Forest Stewardship Council. An FSC certified product has been sustainably sourced and is environmentally friendly, meeting the strict guidelines of the council. Beautiful furniture, fast delivery and great communication.